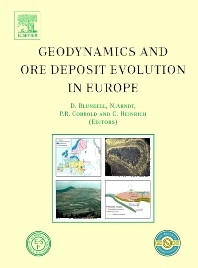 This book presents a new synthesis of the major metallogenic provinces of Europe and the geodynamic processes involved that can lead to the formation of world-class ore deposits. It represents the culmination of a 5-year research programme, GEODE, set up by the European Science Foundation, that brought together researchers across Europe from a wide range of disciplines into collaborative research projects. They focused on five metallogenic provinces across Europe; the Precambrian Fennoscandian Shield, the Upper Palaeozoic Urals, the Variscides of France and SW Iberia, the Alpine–Balkan–Carpathian–Dinaride belt and sediment-hosted deposits of Europe. Because of the long and well-known tectonic history of Europe and the diversity of ore deposits, linkages between geodynamics and ore deposit evolution have been established and new insights into mineralizing fluids and ore formation processes have been gained. Presented as a set of individual review papers and a final synthesis, this book offers a coherent and structured appraisal of geodynamics and metallogeny in Europe, with valuable lessons for mineral exploration and research throughout the world. Preface. Introduction. 1. Subduction, slab detachment and mineralization: the Neogene in the Apuseni Mountains and Carpathians (F. Neubauer, A. Lips et al.). 2. Hydrothermal ore deposits related to post-orogenic extensional magmatism and core complex formation: the Rhodope Massif of Bulgaria and Greece (P. Marchev, M. Kaiser-Rohrmeier, et al.). 3. Geochronology and geodynamics of Late Cretaceous magmatism and Cu-Au mineralization in the Panagyurishte region of the Apuseni-Banat-Timok-Srednogorie belt, Bulgaria (A. van Quadt, R. Moritz, I. Peytcheva, C. Heinrich). 4. Transpressional tectonics, lower crust decoupling and intrusion of deep mafic sills: a model for the unusual metallogenesis of SW Iberia (F. Tornos, C. Casquet, J. Relvas). 5. Late-Variscan mineralizing systems related to orogenic processes: the French Massif Central (V. Bouchot, P. Ledru, et al.). 6. Classification of VMS deposits: Lessons from the Uralides (R. Herrington, V. Maslennikov, et al.). 7. Extensional tectonics and the timing and formation of basin-hosted deposits in Europe (P. Muchez, W. Heijlen, et al.). 8. Precambrian geodynamics and ore formation: the Fennoscandian shield (P. Weihed, N. Arndt, et al.) 9. Processes of tectonism, magmatism and mineralization: lessons from Europe (D. Blundell, N. Arndt, et al. ).